Cwm, near Dyserth could be a well hunter’s paradise, it is claimed that there are around 127 in the parish, although few are named and have any tradition attached. We went on the trail of four the day we visited Cwm, Cil Haul and Asa have already been covered in previous posts, so here we cover the two others, those closest to the centre of the village. The church is dedicated to Saints Mael and Sulien, the church at Corwen is also dedicated to the same pair, who, it has been suggested, may have been brothers. Baring Gould believes they were related to St Cadfan. 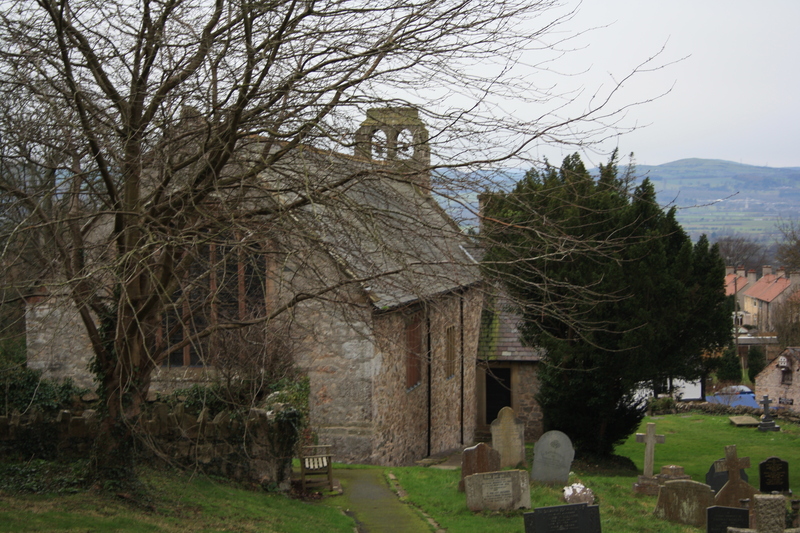 The parish history states they came separately to Wales in the 6th century from Brittany, Mael with Cadfan and Sulien with Rhystyd and Christiolus to become a monk on Bardsey Island. Their joint feast day is celebrated on May 13th. The church was renovated several times during the 19th century, and although it was locked, the lack of stained glass allowed us to see in through the windows and there seemed to be little of interest inside, apart perhaps from some 15th century stone slabs, one of which may once have covered the well. The specific locations of these two wells has become uncertain over time, it even may be that they were two separate names given to the same well. Certainly the main village well was situated beside the church in the vicarage garden. The present building (now a private house) was built in 1847. For convenience this has generally become referred to as the Vicarage Spring, although recent commentators seem to assume that this is Ffynnon Fael y Sulien. The RCAHMW database Coflein does list both wells as separate entities, although Ffynnon Fael y Sulien is given a full grid reference attaching it to the Vicarage, whilst Ffynnon Fair is only approximately allocated to a grid square. The CPAT Report on Wells and Springs (2011)  in questioning the naming of the well, says that given the links with the church the identification of the Vicarage well as Ffynnon Fael y Sulien is a reasonable link, although it stresses that it is Ffynnon Fair that is specifically mentioned by Lhuyd as being by the Vicarage. It may be that the well has borne both names during its history, and it has been said that Ffynnon Fair is sometimes used as a generic name for a holy well. CPAT (2011) report that the well has now apparently been filled in, although the CPAT website record for St Mael and Sulien Church from 2007 implies the well still extant in the Vicarage garden. It isn’t clear whether this is from actual observation, or more likely just an uncorrected assumption based on historical records. All that remains on view today is the overflow cistern from the well. 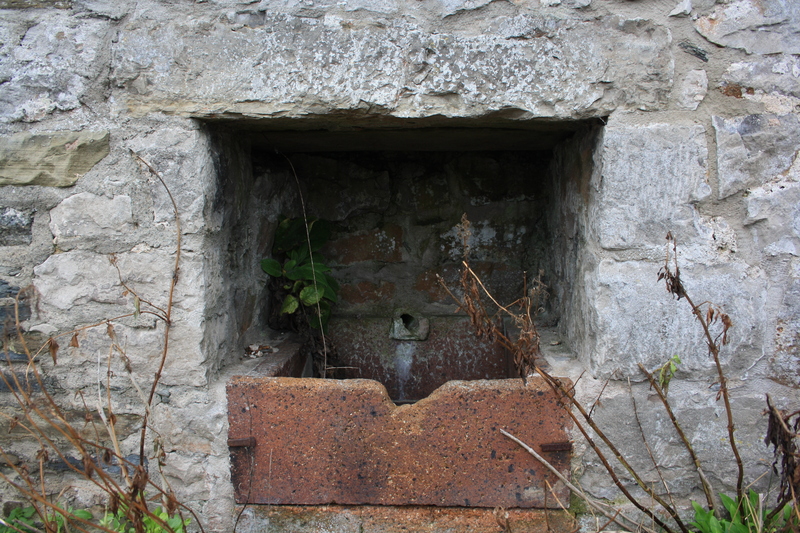 This can be seen as a trough, a little less than a yard square, formed by upright ceramic slabs set into a recess in the Vicarage wall. This tank is now dry, although an underground pipe leads into it from somewhere within the Vicarage garden. Today the school is no longer a school, the lane is no longer a lane and the spring is much more neglected and no easier to find than it was 100 years ago. 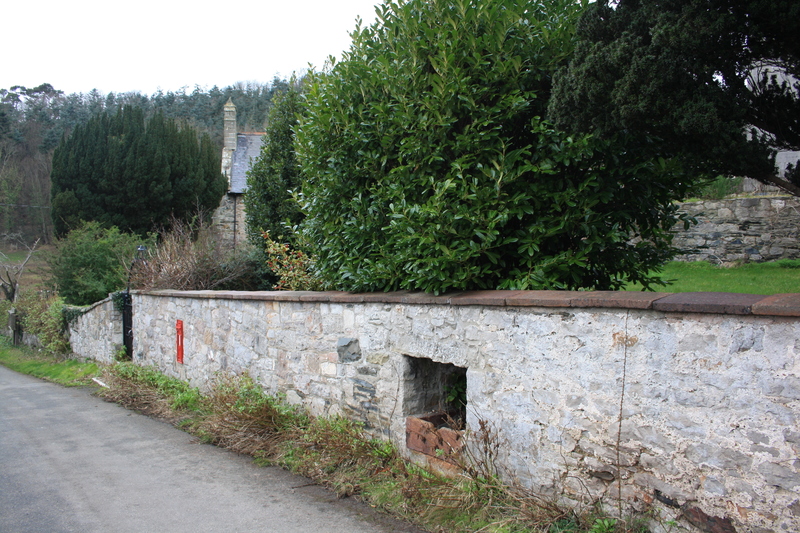 The lane opposite the old school appears at the top end to have been built up to form car parking spaces; lower down it is marked by two rows of trees, and banks to either side, the remnants of old boundary walls or banks. The public footpath across the fields now runs to the east of the old track. Actually Lhuyd does record a Rhyd y Bwbach (a ford) in Cwm, it isn’t clear where this was in relation to the spring. The well takes its name from the Bwbach , a particularly mischievous Welsh sprite along the lines of the brownie or the elf. The Bwbachod have one particular characteristic, which is their dislike of teetotallers and of dissenting ministers, they were often known to harass those who don’t drink alcohol. Thus this is one of a number of Welsh wells named after mythical folk, for example the Goblin well near Mold. No tradition appears to exist in the area concerning this particular well and its name however. 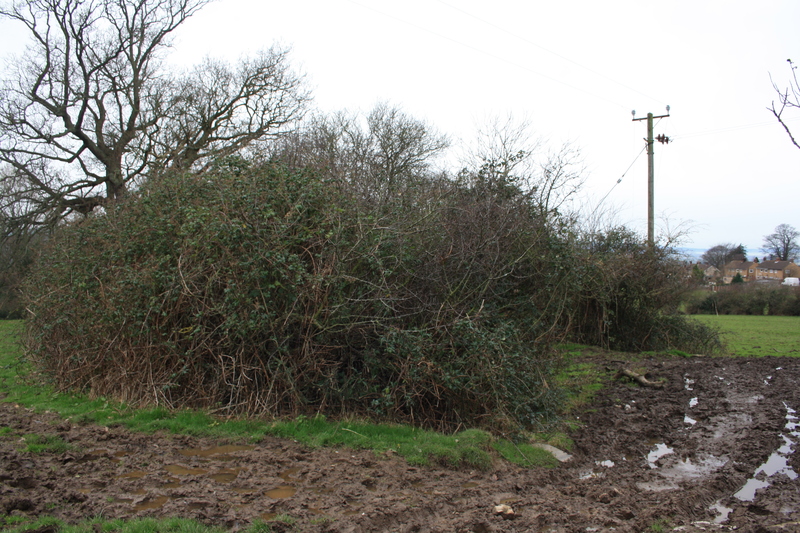 The location marked on the maps is occupied by a hawthorn and bramble thicket, which was completely impenetrable. 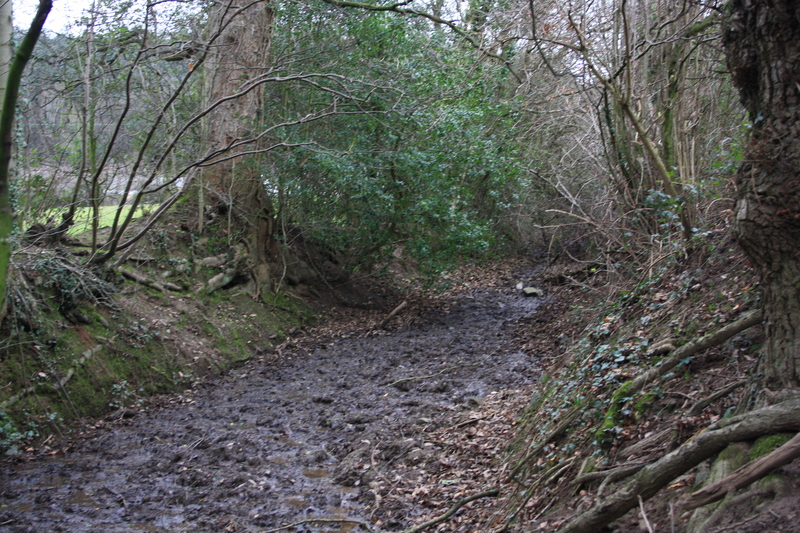 There was a quantity of water flowing down the track, which may well be the output from Ffynnon Bwbach, no source for this could be identified in the mud and brambles. Clwyd Powys Archaeological Trust (CPAT) (2011) Medieval and Post Medieval Monastic and Ecclesiastical Sites in East and North East Wales.